Slow Cooker Recipes - Free Tastes Good! Find all the Best Slow Cooker Recipes below. We started dabbling with the slow cooker because of our busy schedules and found it to be a very easy way to create home-cooked meals without spending a lot of time in the kitchen. As many of you know with a busy work schedule and kids involved in extracurricular activities, the time in between is often too short to prepare a good meal. Fast food ultimately becomes the quickest choice for dinner. With these slow cooker recipes, not only are we eating better, but we are saving money. Once we realized how beneficial the slow cooker was, we began tweaking our normal stovetop and oven menu and turned them into slow cooker recipes as well. After we saw how successful it was for our family, we decided to make this a fun addition to the blog and help all of you at meal time. The one pictured below is my favorite. 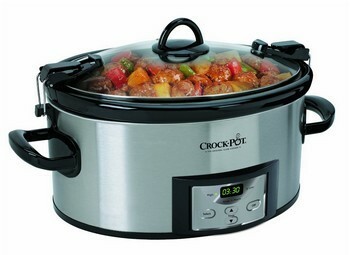 You can order this Crock-Pot SCCPVL610-S Programmable Cook and Carry Oval Slow Cooker by CLICKING HERE. If you are like our family, your days are packed with all kinds of activities and sporting events. Because of that, I have been dabbling with some crockpot recipes. I love to cook so it has been fun to try several different ones. 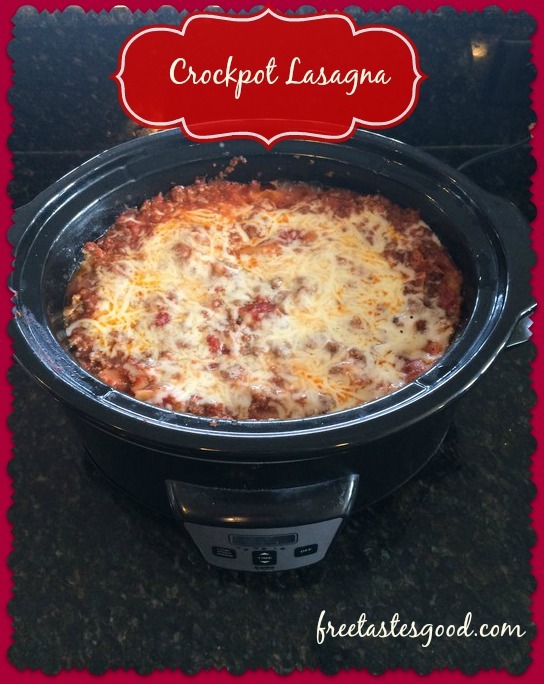 So far, my favorite is this crockpot lasagna. It is super easy to make and only takes approximately 4-5 hours to cook. It is absolutely delicious. Step 1 Cook sausage and hamburger over medium heat 6 to 8 minutes, stirring occasionally, until sausage and hamburger are no longer pink; drain. Step 2 In a separate pan add olive oil, minced onions, minced garlic, diced tomatoes, tomato sauce, dried basil leaves, dried oregano leave, and salt. Cook over medium heat for approximately 10 minutes. Now add sausage and hamburger mixture to same pan. Step 4 Spoon one-fourth of the sausage mixture into 6-quart slow cooker; top with 4-5 noodles (break into pieces to fit in crock pot) Spread with half of the cheese mixture and then 1/4 of the sausage mixture. Top with 4-5 noodles, remaining cheese mixture and 1/4 of the sausage mixture. Top with remaining noodles and remaining sausage mixture. Step 6 Sprinkle top of lasagna with remaining 1 cup mozzarella cheese. Cover and let stand about 10 minutes or until cheese is melted. Cut into pieces. Let me know what your thoughts are on this recipe? Cook sausage and hamburger over medium heat 6 to 8 minutes, stirring occasionally, until sausage and hamburger are no longer pink; drain. In a separate pan add olive oil, minced onions, minced garlic, diced tomatoes, tomato sauce, dried basil leaves, dried oregano leave, and salt. Cook over medium heat for approximately 10 minutes. Now add sausage and hamburger mixture to same pan. Spoon one-fourth of the sausage mixture into 6-quart slow cooker; top with 4-5 noodles (break into pieces to fit in crock pot) Spread with half of the cheese mixture and then 1/4 of the sausage mixture. Top with 4-5 noodles, remaining cheese mixture and 1/4 of the sausage mixture. Top with remaining noodles and remaining sausage mixture. Sprinkle top of lasagna with remaining 1 cup mozzarella cheese. Cover and let stand about 10 minutes or until cheese is melted. Cut into pieces. Let me know what your thoughts are on this recipe? 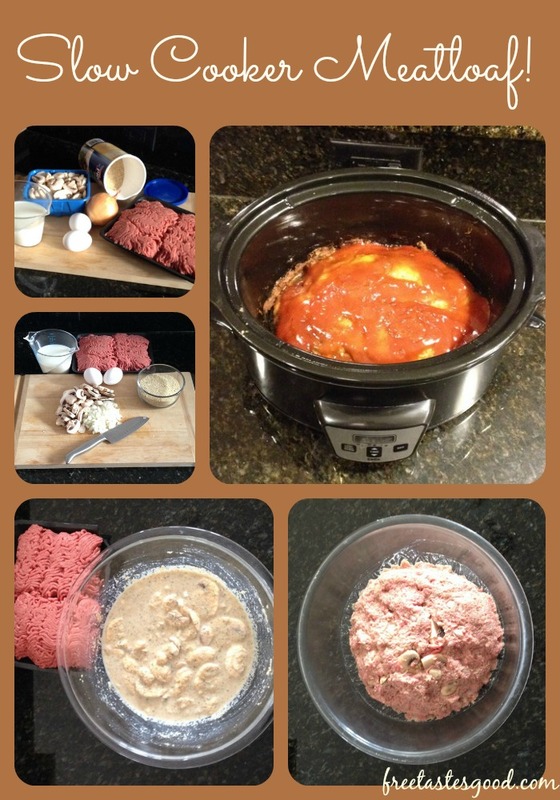 Recipe for Slow Cooker Meatloaf!! If you are like our family, your days are packed with all kinds of activities and sporting events. Because of that, I have been dabbling with some slow cooker recipes and LOVING it. 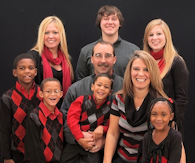 First of all, we are a family that loves to cook so it has been fun to try several different slow cooker recipes. I will be sharing a new one each week. As most of you know, we have done quite a few slow cooker pasta recipes with our favorite being the slow cooker lasagna. This slow cooker meatloaf recipe is super easy and is absolutely delicious. Combine eggs, milk, bread crumbs, onion, mushroom, and salt in a large bowl. Add ground beef and stir well to combine. Shape into a round loaf and place in your crockpot on low for 5-6 hours or until meat thermometer reads 160 degrees F.
In a small bowl whisk ketchup, brown sugar, mustard, and optional Worcestershire sauce. Spoon sauce over meatloaf and now add mushrooms. Return to slow cooker and cook on low for about 30 minutes. Slow Cooker Chicken Breast and Red Potatoes! 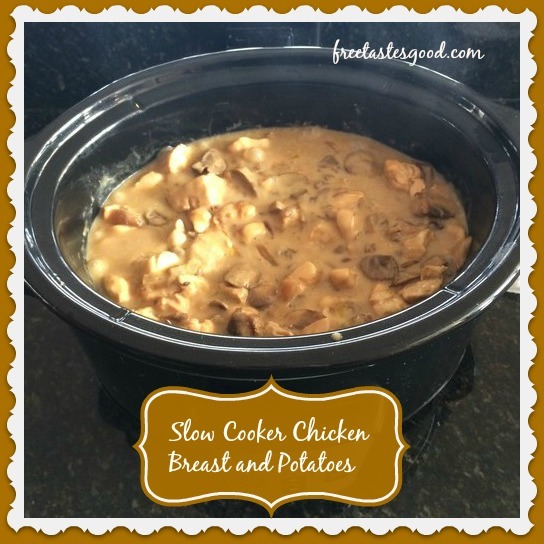 Here is another one of our family’s favorite chicken slow cooker recipes. This one is smothered in a delicious creamy gravy. The three soups make this recipe burst with flavor. There is very little preparation involved in this meal, just slicing red potatoes, cutting chicken, and heating the gravy. It takes approximately 6 hours to cook on low for the potatoes to get tender. The most important part of this meal is not to stir while it is cooking. The potatoes need to stay at the bottom to absorb the gravy and become tender. Stirring this recipe adds to the cook time. Our family loves chicken slow cooker recipes so be looking for more to come in the near future. I hope you find these meals are saving your family time and money. Below is our slow cooker chicken breast and red potatoes recipe. Cut the chicken into bite size chunks. Brown in a small amount of olive oil. Add mushrooms and garlic and cook for an additional 4-5 minutes. Layer red potato slices in bottom of slow cooker. Add 1/2 of the onion and mushroom mixture. Place the rest of the onions and mushrooms on the chicken. Empty all three soups into a pan. Stir and combine thoroughly. Pour soup mixture over chicken. Cook on low for 5-6 hours or until potatoes are tender. 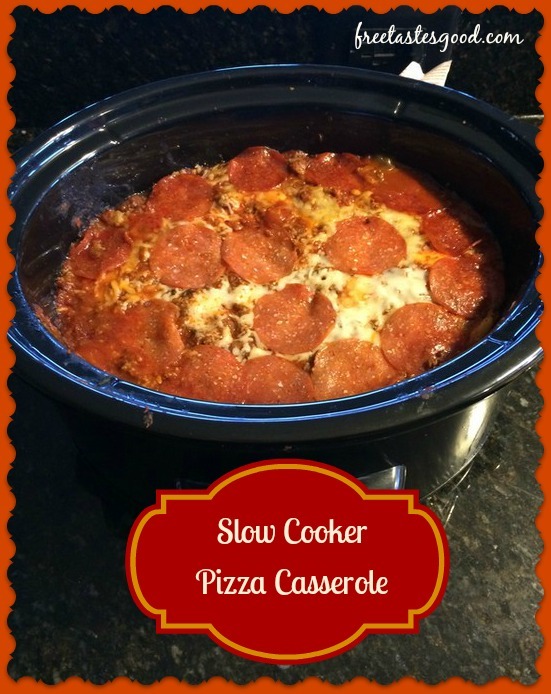 I am having so much fun dabbling with these slow cooker recipes. 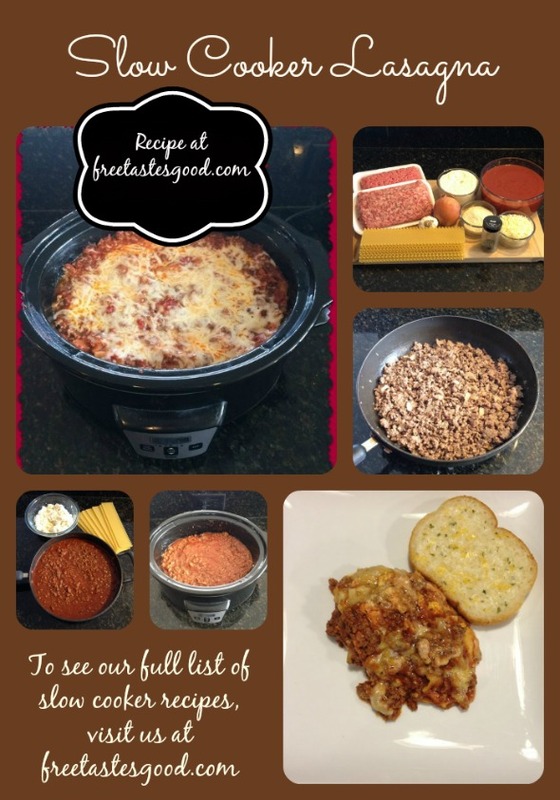 Our family especially loves the slow cooker pasta recipes and this lasagna slow cooker recipe is one of our favorites. Jamie and I have tweaked our own pasta sauce and we included that in this recipe. We served this meal at the FREE community dinner and everyone loved it. It is super easy to make and only takes approximately 4-5 hours to cook. If you like Italian food, I think your family will really enjoy this meal. I hope you are all enjoying these slow cooker recipes. 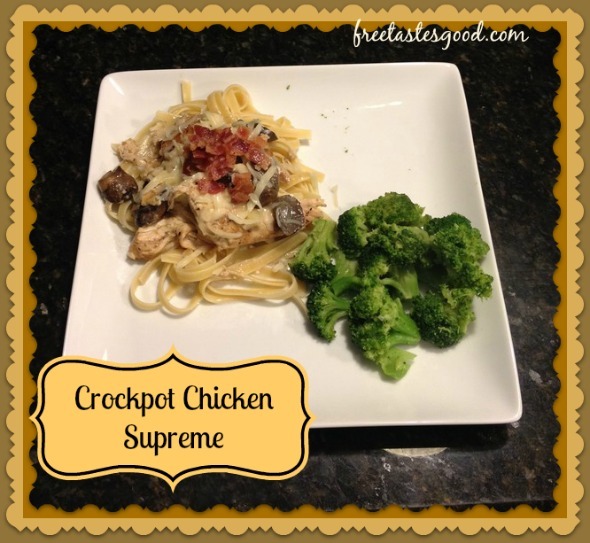 This Crockpot Chicken Supreme is another one of our favorites. We have personalized it using our homemade Alfredo sauce, but you can substitute it with a can of cream of mushroom soup or a jar of your favorite Alfredo sauce. We like to serve this over fettuccini noodles, baked potato, or rice. We are having fun taking pictures and posting them. Jamie and I both love to cook so we are enjoying our time in the kitchen together. This is another very easy meal with very little prep time. We love our slow cooker chicken recipes not only for the taste, but for the time it saves us. This meal is short on ingredients, but full of flavor and with very few steps, can be prepared in no time. The cook time is approximately 4-5 hours and as with all slow cooker chicken recipes, the chicken is so tender, it falls apart. In large skillet cook bacon until crisp. Remove bacon from skillet and drain on paper towels. In skillet with bacon drippings, cook chicken over medium heat 3-5 minutes until light brown, only turning one time. Place in a 4-6 qt slow cooker. In skillet, saute the mushrooms in the bacon drippings. Once sauteed, add the garlic, heavy cream, and butter and bring to a boil. Reduce heat and add 1 cup parmesan. Simmer until cheese is melted. Once heated, pour over the chicken. Cover and cook on low setting for 4-5 hours. Once done, sprinkle with bacon. This chicken will literally fall apart when you serve it. Delicious and chicken is so tender it will fall apart. We serve this over fettuccini noodles. Here is another one of our family’s favorite meals. We love all these slow cooker italian recipes. This one can be modified in several different ways to suit your taste. You can use cheese or meat ravioli, jar pasta sauce or our homemade pasta sauce. You can also add your favorite pizza toppings like olives, banana peppers, and/or bacon. Prep time is approximately 20 minutes and it cooks in about 4 hours on low. We love to serve this with garlic breadsticks. Super easy yet delicious money saving meal. For all of us that coupon, pasta sauce and pepperoni are common ingredients that go on sale. 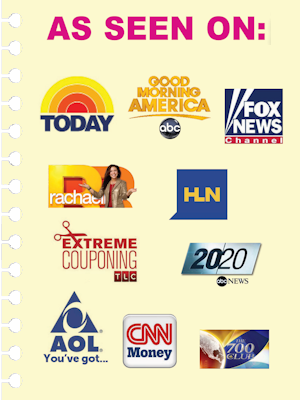 With the use of Sunday insert coupons or printable coupons we can purchase these at a significant discount. This is why I highly recommend stockpiling these staple food items when we can purchase them for pennies on the dollar. Spray bottom of slow cooker with cooking spray. In skillet cook sausage over medium heat until no longer pink and drain. Place sausage in large bowl. In same skillet, cook ground beef, onion, and garlic until ground beef is thoroughly cooked and onion is tender, drain. Add ground beef, 1 jar of pasta sauce (or half of homemade pasta sauce), and sausage. Stir to combine thoroughly. In slow cooker, spread half of remaining jar of pasta sauce (Or homemade sauce) to cover the bottom. Layer with half of the ravioli and half of the meat mixture. Cover, cook on low heat for 4 hours. ENJOY!!! As most of you know, we started a new section on the blog with our slow cooker recipes. 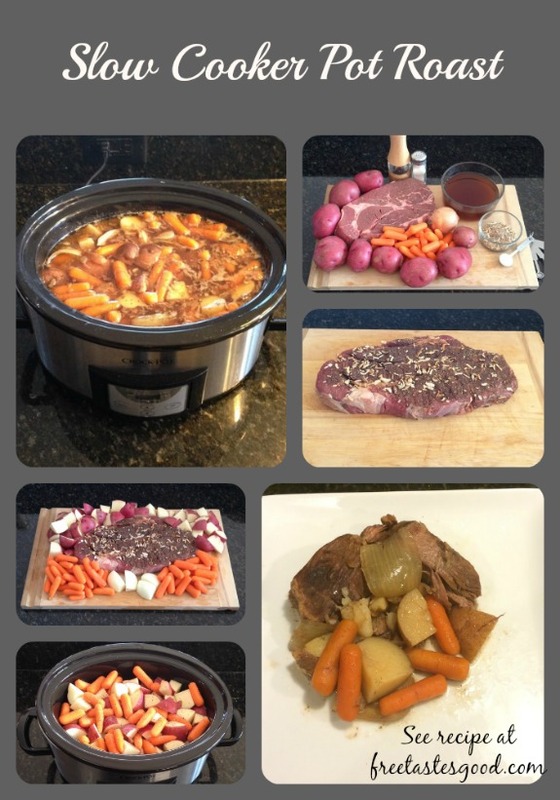 We have had so much fun working with our slow cooker. So many families, due to time constraints, get into a rut of making the same meals week after week. With all of us knee deep in work, homework, and extracurricular activities, we have found this to be very beneficial to our family. Not only is this a time saver, but it is also saving us money as we no longer have to pick up fast food and can still have a delicious home cooked meal. The prep time on these meals is minimal and most can be prepared the night before. The best part about the slow cooker pot roast recipe is the longer it cooks the more tender the meat becomes. Having dinner as a family is important to us and preparing these slow cooker recipes is allowing us to eat together nightly. Combine onion mix and garlic powder. Stab the mixture into the beef using a meat tenderizing tool or fork. Place the roast on top. Quarter the red potatoes and place carrots and red potatoes on top of roast in slow cooker. If you are like our family, you are busy with all sorts of activities every evening so these slow cooker recipes have been a life saver for us. Many of us are working a full-time job and gone most of the day, so having a slow cooker with a timer still allow us to prepare a meal that will be ready when we get home from our busy day. We have been dabbling with all sorts of new recipes and tweaking them to our liking. Our kids have become BIG fans of the slow cooker meals as well because it makes our whole house smell good 🙂 I thought this would be a cool way to share some NEW slow cooker recipes and hopefully save your family some time as well as offer a fantastic alternative to fast food. 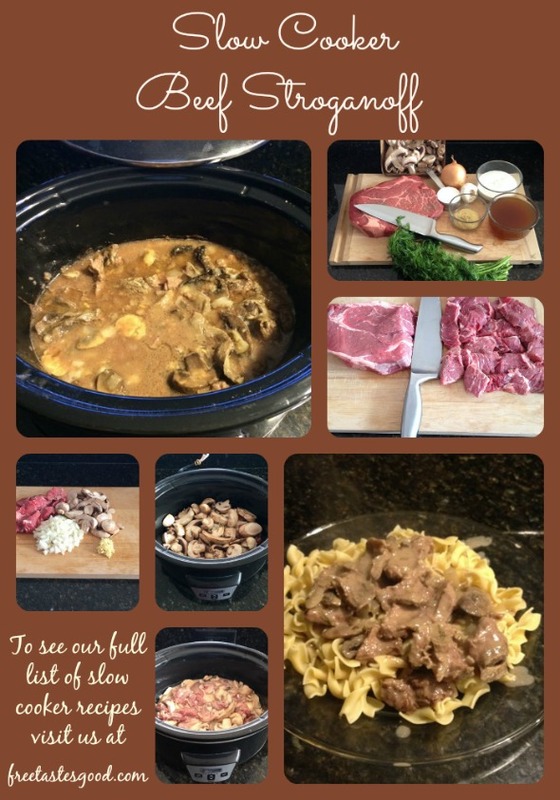 The Beef Stroganoff Slow Cooker Recipe is very easy to prepare and the longer it cooks the more tender it becomes. You can use either London Broil or Beef Chuck Roast. We prefer the Beef Chuck Roast, but either works just fine. I highly recommend slicing it thin. This allows it to cook better and the meat becomes much more tender. Let us know your thoughts after you have tried it please. In a bowl, add the beef broth, flour, and mustard and whisk. Pour mixture over beef and mushrooms and stir to combine. Cover with lid and cook on low for 8 hours or on high for 5 ½ hours. Once the meat is tender, add sour cream and fresh dill. Stir to combine.